Remember Shirley Jackson's short story "The Lottery?" (I thought it was required reading, but when I mentioned it to my husband he just stared at me blankly - so, if you're unfamiliar with it, click here.) Anyway, if that little tale of macabre sent shivers down your spine, just wait. 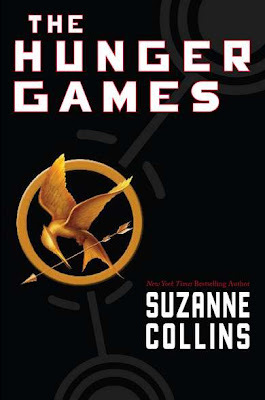 The Hunger Games by Suzanne Collins combines the subtle horror of Jackson's classic story with the challenge and excitement of a Survivor episode. What results is a completely absorbing story that will eat you up and spit you out only after taking you on a heart-pumping, nail-biting, edge-of-your-seat thrill ride. It gives "unputdownable" a whole new meaning. The story takes place in Panem, a futuristic world built on the ruins of what was once known as North America. It consists of a glittering Capitol and 12 surrounding districts, each of which specializes in a certain industry - agriculture, fishing, factories, etc. Sixteen-year-old Katniss Everdeen hails from District 12, an area once known as Appalachia. Like its ancient inhabitants, residents of the district labor in the coal mines. Like their earlier counterparts, the general population is poor, underfed and diseased from the black dust that never quite dissipates. Working in the mines can be perilous, a fact which Katniss knows all too well - the job put her father in an early grave. His death paralyzes her mother, forcing Katniss to keep the family alive. This means sneaking under the city's electrified fence to hunt, trading her spoils in the black market, and risking her life for a meager amount of grain. The novel opens on Reaping Day, a grim holiday where 2 kids from each district are chosen to participate in The Hunger Games. Having traded entries into the Games for grain - multiple times - Katniss' chances of being chosen are dangerously high. As are those of her best friend, Gale. Her only solace is that all of her entries should leave her beloved younger sister virtually risk-free. Through a cruel twist of fate, Katniss becomes District 12's female "tribute." The "honor" means Katniss will compete in a Survivor-style game against 23 other tributes. Only it's a fight to the death. Winning means honor, but more importantly, it means the winner's family will have food, money and shelter. It also means 23 people will die. Just like last year. And the year before. And every year. The Games are a gruesome, televised bloodbath - a gory reminder of who's really in charge in Panem. Participation is mandatory. It's also suicide for a scrawny, undernourished girl from District 12. Before she knows it, Katniss is fighting for her life in an arena fraught with danger, much of which is manufactured by Games officials for the entertainment of Panem viewers. Katniss can't afford to feel any affection for her fellow competitors, but there's the little girl who reminds her of her sister, the boy from her own district who once showed her an immense kindness, and all the others who are just as terrified as she is. But it's kill or be killed in the Games. Katniss has no choice. She must use every brain cell, every skill, everything she possesses to save herself and her family. Her journey will be fraught with danger, betrayal, loss and her own grim determination. In a battle that defies logic, Katniss must do the impossible - survive. So much has already been written about this novel that I doubt I can add much. I'll leave it at this - you must get your hands on a copy of this book. It's gripping, it's consuming, it's one of the best books I've read this year. What are you still doing here? Beg, borrow or steal (well, maybe you shouldn't go that far) - do whatever it takes to get yourself a copy. You won't regret it. Or forget it. I just read this one last weekend. and couldn't agree more! Loved it! The Lottery creeped me out. We also watch the adaptation of it (a very old short). Isn't it funny how certain stories just stay with you over time, no matter how long it's been since you've read them?! I have had Hunger Games on my shelf for two months now. (Maybe longer?) I've put off reading it because I know the next one doesn't come out until September. I wanted so I could read one right after the other, but everyone keeps reviewing it and talking about how awesome it is, I might give in to the urge!! I remember the Lottery, it just sticks with you. Read Hunger Games a few months ago and was both intrigued and terrified by it. Could not put it down and am waiting, not so patiently, for the sequel. This is one of my favorites!! I read it at the beginning of the year, and still haven't gotten myself my own copy! Your reviews are awesome! You say what I want to say - and more! I knew you would love it. I found it riveting. I'm glad that I have some time before the sequel comes out. I need to ponder, digest, and mull over this brillantly plotted story. What shall we read next?? Loved loved loved this book. Favorite book all year. I never buy books but I got his one for my birthday. I would describe this book as The Lottery meets Gladiator. Couldn't agree more ... Loved the book .... And now hanging out for the next one !! Yes, yes, yes. Totally made me think of the Lottery too. I am dying for the next book! I think I'm going to have to break down and read this. I've seen so many great reviews. LOVED this book. I'm hoping to pick up the sequel at BEA. If I don't I'll be really sad. I've had my eye on this one for a while. I can't wait to read it. Great review! I LOVE LOVE LOVE THIS BOOK! It was one of the best things I've read in a long time! It is so funny that you likened the plot to The Lottery, one of my all time favorite short stories! I just finished The Hunger Games and at the reaping thought about The Lottery and the similarity between the two! What an awesome books! One of my favorites in a long time! Great review. What a great review!! Thanks for this.